As a lung doctor who specializes in COPD, I came into the picture during her second hospitalization. I took this opportunity to both teach Ms. B. how to manage her condition on a daily basis. I also decided to model behaviors and techniques for our team of physicians in training. I wanted to show how to motivate a patient like Ms. B to become a member of the healthcare team. I started her on the appropriate inhalers and, after detailed education, she showed us that she knew how and when to take them. I also told her that she needed supplemental oxygen. Ms. B expressed grief, anger, and frustration about being tethered to an oxygen tank 24/7. She said that she didn’t know if she could quit smoking forever because she’d tried and failed many times before. So, I used motivational interviewing and other techniques to help her see that she could stop smoking. How? With Ms. B having the right attitude and a lot of help from our whole team. I next saw her in follow-up clinic about two months after being released from the hospital. Ms. B introduced me to her new friend, Joe. She said that she and Joe went everywhere together — the shopping mall and grocery store, Spurs games, and even to Zumba classes. Since I only saw Ms. B in the examination room, I asked her if Joe stepped out to go to the bathroom. She laughed! She said, “no” and then excitedly pulled out her green oxygen tank with fully decorated black cover. 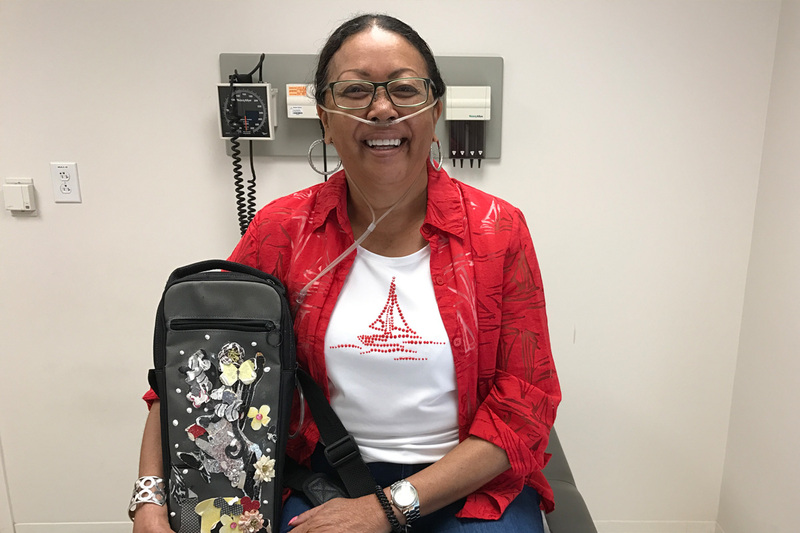 She then shared that she originally felt like a casualty in the war against COPD and was not going to be punished by wearing oxygen tubing for the rest of her life. However, after our conversations in the hospital, Ms. B decided to see things differently. So, she added her oxygen tank to our healthcare team, named him, and saw him as a friend rather than the enemy. Yes! As I experienced with Mr. P (see the blog: THE STORY OF MR. P WITH UNCONTROLLED COPD), my Mission of Infusing Hope made a major improvement in the life of Ms. B.
I’m pleased to report that it’s now been three years since Ms. B was hospitalized and she is doing great! Along with Joe, she’s remained an active member of her healthcare team and no longer sits on the sidelines as a passive observer. Actually, she’s become a master at advocating for herself. She takes the bull by the horns and is now leading a full and active life.